From the City of London, via the Thames Conservancy, the PLA has inherited ownership of the bed of the river and foreshore from Teddington to the Yantlet Line (between Southend and Grain). The PLA has three channel surveying vessels, eight launches for harbour and river patrols, and twenty other craft. Five new patrol vessels were built by Alnmaritec in Northumberland and delivered in 2009. 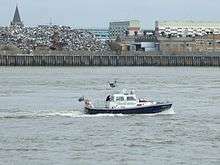 For much of the 20th century the PLA had its own Police, but today the port is policed by a number of forces: the Metropolitan, City of London, Essex and Kent constabularies, and the Port of Tilbury Police formed in 1992 as a remnant of the former PLA Police. ↑ "Port of London Act 1968, Schedule 1" (PDF). p. 108. Retrieved 2014-09-12. ↑ "Standard Letter re Access to the River Thames" (PDF). London Assembly. Archived from the original (PDF) on 2007-06-30. Retrieved 31 March 2009. ↑ "Vessel Traffic Services". 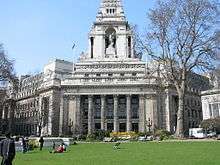 Port of London Authority. Retrieved 31 March 2009. 1 2 3 "Short Guide to the PLA" (pdf). 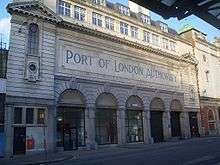 Port of London Authority. Retrieved 31 March 2009. ↑ "New PLA Patrol Boats". 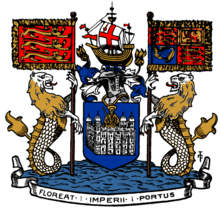 Port of London Authority. Retrieved 31 March 2009. ↑ "Port of London Authority". Flags of the World. Retrieved 31 March 2009. ↑ Fox-Davies, A C (1915). The Book of Public Arms, 2nd edition. London: T C & E C Jack. p. 620. ↑ Scott-Giles, C Wilfrid (1953). Civic Heraldry of England and Wales, 2nd edition. London: J. M. Dent. p. 261. ↑ Winchester, Clarence (1935). "Industrial railways 2". Railway Wonders of the World: 1505–1507. ↑ Marden, Dave (2013). London's Dock Railways Part 2. Southampton UK: Kestrel Railway Books. p. 76. ISBN 978 1 905505 28 9.